Due to high reliability and availability, Platon Webhosting uses four own independent domain name servers - DNS. Domain servers are used for translation of domain names to real server IP addresses. For example when you enter www.platon.sk into your web browser, it gets translated to 85.248.228.11. Our DNS servers are connected through automatic online data replication and DNS record transfer is fast and error-free. In certain cases it could be required to enter not only domain servers, but also corresponding IP addresses. In favor of stability and availability of your web pages, please enter all 4 entries. Do not skip any. 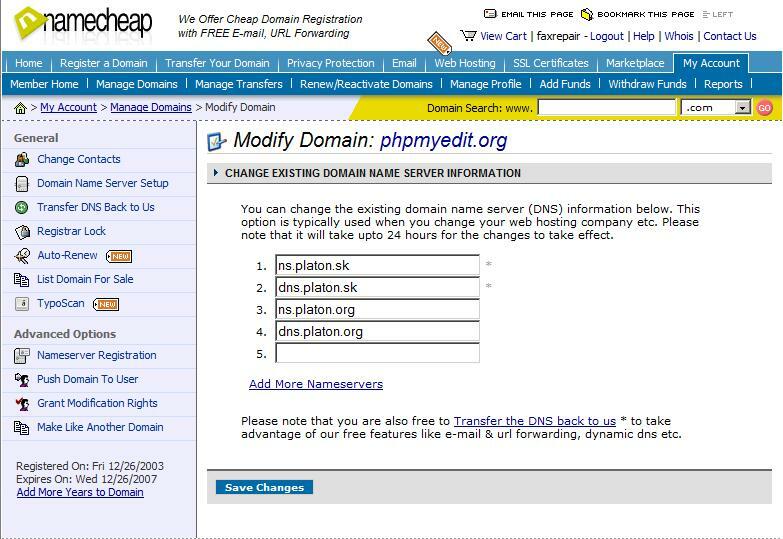 If it is not possible to enter more than two nameservers, fill-in ns.platon.sk and ns.platon.org. If you need more information or recommendations regarding to DNS servers setting on your domains, please contact us at support@platon.org e-mail address.